Manchester City clinched an emphatic win over West Brom to move back up to third place in the Premier League with one game remaining. A point in their final game at Watford on Sunday will now be enough to guarantee Pep Guardiola's side a place in the top four and Champions League football, while a win would see them finish third and go straight into the group stage. This was as straightforward a victory as City could have anticipated at this stage of the season, as two goals in two first-half minutes put them in control against a Baggies side that lacked ambition and did not seriously threaten until the final stages. First, Sergio Aguero's flick fed Kevin de Bruyne, who burst into the left-hand side of the area before squaring the ball to give Gabriel Jesus an easy tap-in. One minute and 46 seconds later it was 2-0, thanks to a brilliant first-time finish from De Bruyne after Aguero's attempt to tee up Jesus was cleared into the Belgian's path on the edge of the area. Yaya Toure made it 3-0 after the break, exchanging passes with Aguero as he marched into the area to slot past Ben Foster. West Brom managed a late consolation when substitute Hal Robson-Kanu turned in Allan Nyom's low cross. With the points all but secured by Toure's goal, attention for many City fans switched to Pablo Zabeleta's big send-off. After nine years with City in which he won every domestic trophy, the 32-year-old Argentina defender is leaving the club at the end of the season. He started on the bench but the home fans sang his name from kick-off, gave him his first standing ovation of the night in the first half and then exploded into noise when he began warming up. The ground rose to applaud him on to the pitch when he replaced David Silva on the hour mark, and then cheered every time he touched the ball. Zabaleta ended the game wearing the captain's armband after Vincent Kompany was substituted and West Brom's belated fightback never threatened to ruin his night. After an emotional farewell speech at the final whistle, when he was joined on the pitch by his wife and young son, Zabaleta was given a guard of honour by his team-mates as he and his family departed down the tunnel. Gabriel Jesus and Sergio Aguero were also strong candidates but the in-form Belgian edged it thanks to his assist for City's first goal and particularly his finish for their second. De Bruyne's form dipped in mid-season but he currently looks near to his best. Arsenal manager Arsene Wenger, who was hoping for a City slip here to allow his team back into the top four, had accused mid-table teams of being "on holiday" before the game. If those comments were designed to sting the Baggies into life, they did not work. West Brom's form has dropped off the proverbial cliff since they beat the Gunners at the Hawthorns at the end of March, and they never looked like reversing it here. You could not accuse Tony Pulis' side of not trying at Etihad Stadium, but their effort was mostly defensive - even after they fell behind. Defeat stretched their winless run to eight games, a run in which they have scored only three goals and picked up two points. They also drop one place to ninth - slipping below Southampton on goal difference - and the end of the season can seemingly not come quickly enough for them. Manchester City boss Pep Guardiola: "It is in our hands to finish third so it is the best thing. "To finish in front of Manchester United, Arsenal, Liverpool, it means a lot. Maybe next season hopefully we can do better." West Brom manager Tony Pulis: "They deserved to win tonight. Once they got their noses in front, they're a difficult team to pull back. "The two quick-fire goals killed us. When the third one went in, you're looking down the barrel." Manchester City are now unbeaten in their last 12 Premier League home games, their longest run without defeat in the competition since a run of 37 home games from December 2010-December 2012 under Roberto Mancini. Defeat for West Brom means they will not be able to equal or better their previous best points haul in a Premier League season, which was 49 in 2012-13. 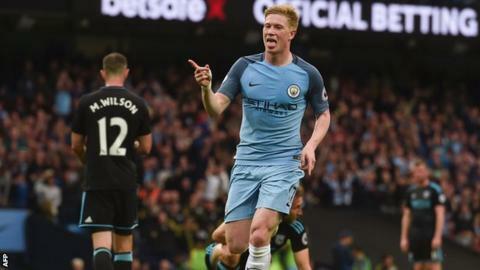 No midfielder has been involved in more Premier League goals than Kevin de Bruyne in 2016-17. His figure of 22 (six goals and 16 assists) is level with Swansea's Gylfi Sigurdsson and Tottenham's Dele Alli. Gabriel Jesus has now scored six goals and provided assists for a further three in only seven Premier League starts for Manchester City. The Brazilian is averaging a goal or an assist every 62 minutes in the league this season, the best ratio of any player in the competition (minimum 500 minutes played). Pablo Zabaleta made his 117th and final Premier League appearance at Etihad Stadium, the most of any outfield player for City. City finish their season against Watford at Vicarage Road on Sunday (15:00 BST), at the same time West Brom wrap theirs up with a trip to Wales to play Swansea. Corner, West Bromwich Albion. Conceded by Aleksandar Kolarov. Goal! Manchester City 3, West Bromwich Albion 1. Hal Robson-Kanu (West Bromwich Albion) right footed shot from the centre of the box to the centre of the goal. Assisted by Nyom with a cross. Attempt saved. Gabriel Jesus (Manchester City) right footed shot from the right side of the box is saved in the top centre of the goal. Attempt saved. Gabriel Jesus (Manchester City) right footed shot from the right side of the box is saved in the centre of the goal. Assisted by Fernandinho. Attempt missed. Fernandinho (Manchester City) right footed shot from outside the box is too high. Assisted by Leroy Sané. Substitution, Manchester City. Fernando replaces Yaya Touré. Attempt blocked. Fernandinho (Manchester City) header from the centre of the box is blocked. Assisted by Kevin De Bruyne with a cross. Corner, Manchester City. Conceded by Jonny Evans. Attempt blocked. Sergio Agüero (Manchester City) right footed shot from outside the box is blocked. Assisted by Kevin De Bruyne. Leroy Sané (Manchester City) has gone down, but that's a dive. Attempt saved. Gabriel Jesus (Manchester City) left footed shot from the centre of the box is saved in the top centre of the goal. Assisted by Fernandinho. Substitution, West Bromwich Albion. James Morrison replaces Jake Livermore. Attempt missed. Salomón Rondón (West Bromwich Albion) header from the centre of the box misses to the right. Assisted by James McClean with a cross. Corner, Manchester City. Conceded by Salomón Rondón. Attempt missed. Vincent Kompany (Manchester City) right footed shot from outside the box misses to the left following a corner. Corner, Manchester City. Conceded by Nyom. Goal! Manchester City 3, West Bromwich Albion 0. Yaya Touré (Manchester City) right footed shot from the centre of the box to the centre of the goal. Assisted by Sergio Agüero.